The most essential tools for any BBQ chef is the shovel, Poker and cooking fork. Hand made in Argentina these extra long handled fire cooking tools mean that you can control and move the hot embers and turn your meat without getting burnt Knuckels!!!!! Hand crafted from mild steal with wooden handles. Our Quebracho Asado wood has the lowest moisture content of any wood available at 0 to 1 % moisture content. If you compare this to a Kiln dried firewood in the UK which ranges between 20 – 30% moisture content. It’s extremely dry, rock hard and heavy which is why it takes so long to burn with an extremely hot output of heat giving amazing long burn times. With virtually zero smoke production, no wasted energy burning off extra moisture and the very best return in calorific value terms that money can buy – the 20kg bag is roughly equivalent to 3 or 4 large nets of seasoned firewood typically available in the UK. Asador Criollo Cross, also called a Patagonian Cross or Asador, with Adjustable Base, Hand-forged in Argentina, this is an original Argentine spit, use by the likes of Francis Mallman. Perfect for roasting racks of beef, half a lamb or anything else you want to roast over an open fire! Dimentions 1,25 high, 50 cm. deep and 72cm long base/foot. PLEASE NOTE: we are currently waiting for our automated online shop to be implemented, in the meantime can you please CLICK HERE to send us your order via our contact page. Food is tasty when it is served in wooden plates! These are the perfect plate for a traditional Asado barbecue. They can be ordered as a set or individually.The plates have a carved recess surround to prevent any juices from running over the edge of the plate, just perfect for a juicy steak!!!! 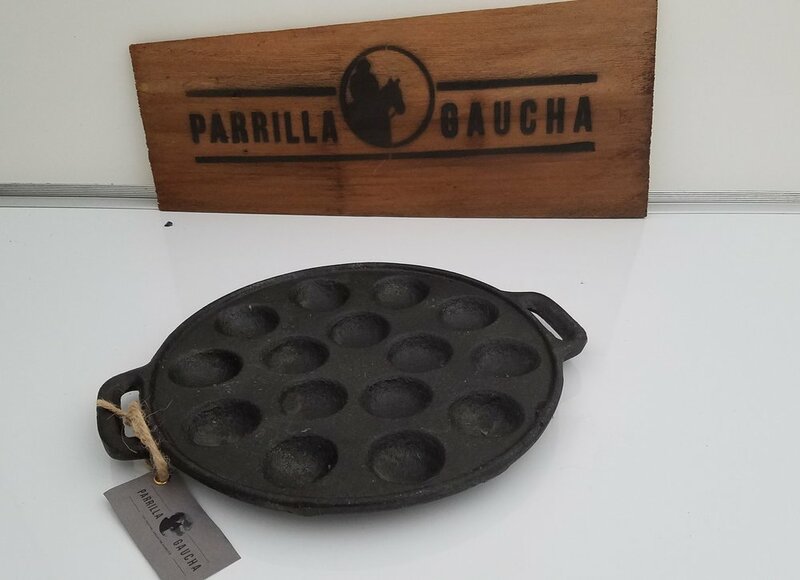 The Parrilla Gaucha Provoletera Pan makes 15 starter portions. 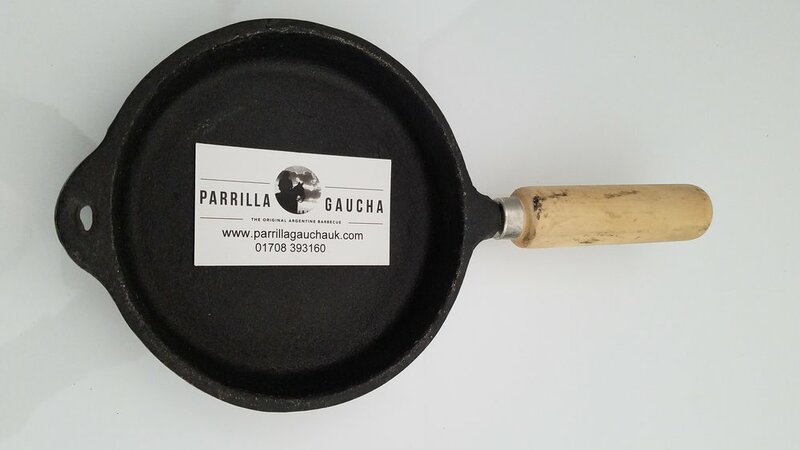 Traditionally made by hand this high quality cast iron dish is made to be placed directly on the BBQ Coals to produce succulent mini portions of provoleta a favourite dish at any Asado. REALLY IMPRESS YOUR GUESTS WITH YUMMY HOT APPETIZERS LIKE , STUFFED MUSHROOM CAPS OR MELTED PROVOLONE CHEESE. Protect your cookware with this superb wooden spoon. Can be used safely with non-stick pots, plow discs, pans and trays without damaging the surface, helping you keep your equipment in superb condition. Incredibly versatile, the spoon can be used for everything from grilling, baking to frying, making it an essential tool for any domestic or commercial kitchen. Robust, durable and reliable, the spoon is designed to withstand the rigours of any busy kitchen, guaranteeing excellent results every time. 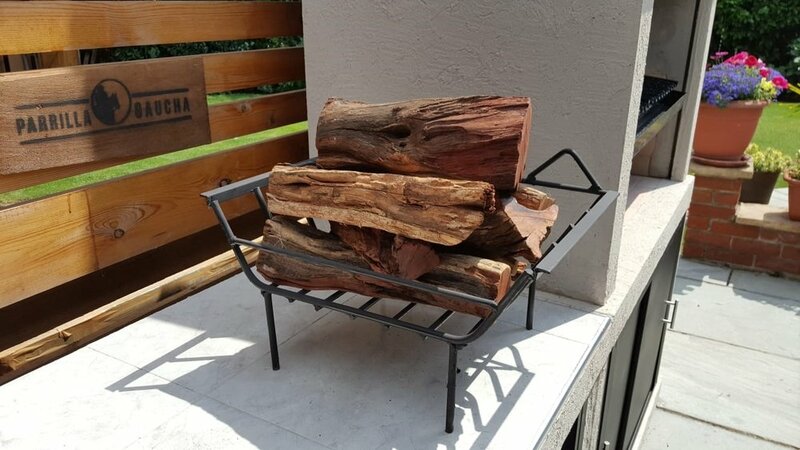 The best way to serve and keep your Asado hot! Straight from the barbecue to your table. To use just fill your brasero with a few hot coals from the BBQ, place your cooked meat on the hotplate and serve direct to the table. The Brasero will keep your meat and vegetables warm all through your dinner. 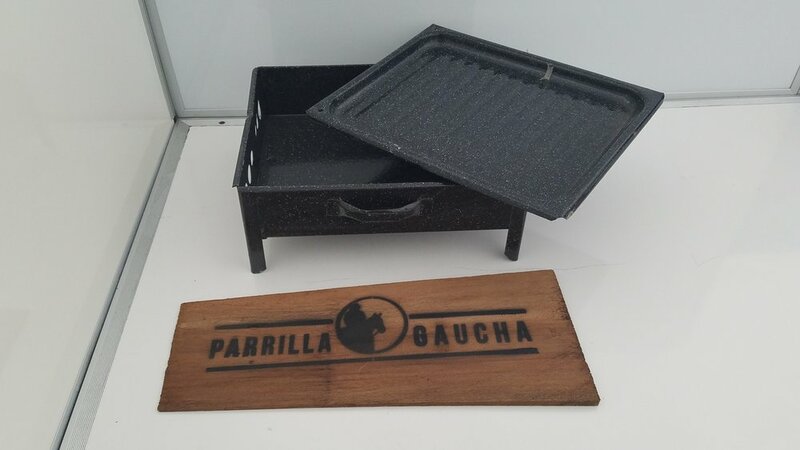 The Parrilla Gaucha Brasero has carry handles and is enamelled so it is non stick, will not rust and makes for easy cleaning. 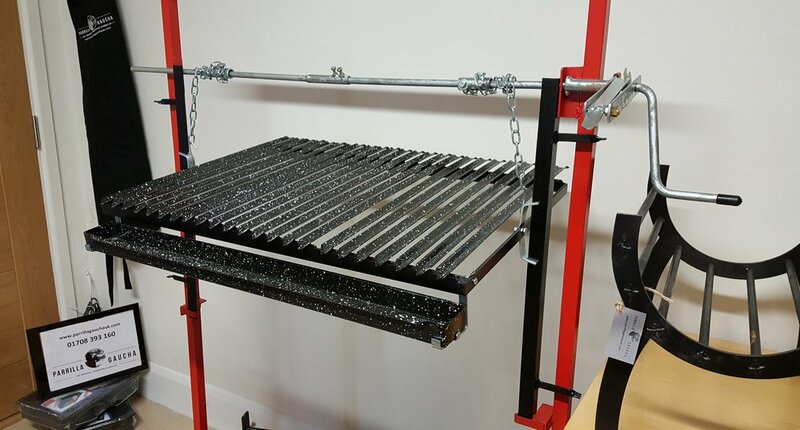 The “Plancha” It is the ideal assistant to cook all the recipes you want from steaks, burgers, rustic potatoes, eggs, vegetables, and transfer the intense flavors from one food to another in the same cooking. • Saves gas or energy due to rapid cooking. • It has anti-stick properties that improve every time you use it. • Perfect balance between thickness and weight, which allows easy manipulation. • Detachable legs to be used both directly on the grill and in the kitchen. Perfect for serving hearty steak dishes, these rustic hand carved solid wood plate/ board measures over 18cm wide 38cm long, and provides plenty of space for steak, chips and a side dish/salad. 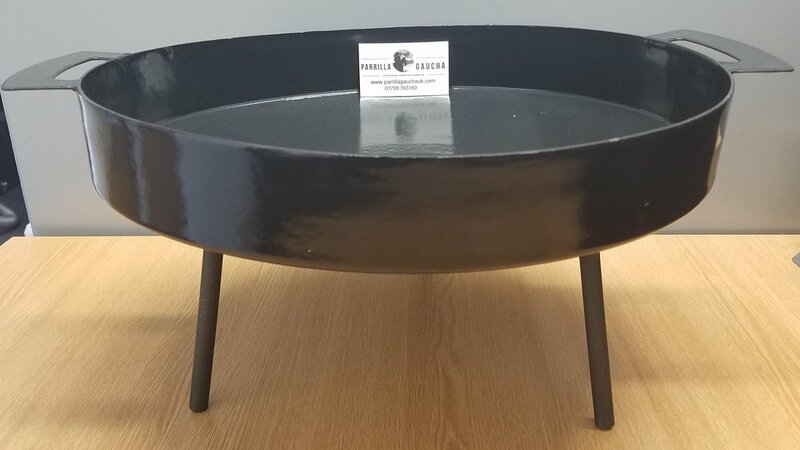 This chunky plate has a recess that surrounds the outside perimeter to prevent any sauces from running over the edge and spilling onto the table, while a cut-out provides space for a side dish or salad. The Dual use plough disc consists of a “Main Disc” with higher walls to increase capacity. Can be used to make stews, paella, or to cook any vegetables and meat. The Secondary disc or “BIFERA” can be used as a separate disc to cook on or as a lid due to its detachable legs. It can also be used to provide an oven cooking effect by using as a lid with embers on top. This enamelled coated disco is ideal to use over coals, open fire, on a grill, and even inside on their stove top. The cooking experience is hands-on and involves moving food from the hot center to the cooler edges. When cooking for the 1st time, we recommend you lightly coat the entire cooking surface with vegetable oil, use a medium heat, and just start cooking! · Set includes 2 hand turned hardwood plates (22cm diameter). 2 sets of knife/folk with real wood handles contained in a beautiful handcrafted faux leather case, ideal for a Picnic or as a gift for an Asado fan! · Colours include brown, tan, green and black. Start eating healthier and better tasting food when you cook with this stove top grill without needing to spend as much time and effort! Our Parrigas has arrived direct from Argentina! HEALTHY COOKING - Reduce fat and cholesterol in foods while sealing in flavor and juices when grilling any meat, fish, vegetables and much more. Our stove top trayl is enamelled non-stick, so you can cook all types of meat, vegetables without needing oil or butter. A healthy and delicious alternative to pan frying or broiling that brings the great taste of outdoor food inside. 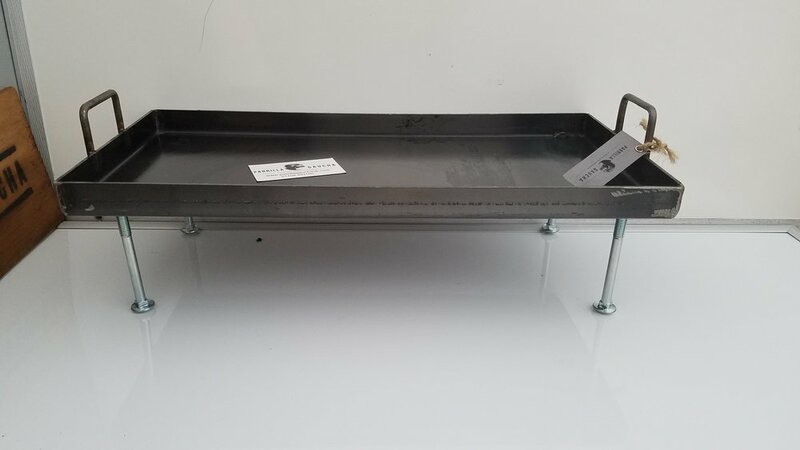 DRIP PAN - Unlike most other pans , our stove top grill has an integrated drip pan that catches excess fat and grease and prevents flare ups. Adding water to the drip pan helps eliminate unpleasant smoke and grease splattering for a cleaner grill experience. -Ideal to use with plow discs, bifera plates, pots, etc. Through the area of the inclined tube load the firewood and by the one underneath regulate the entrance of air using the cover to adjust the flame. Ash tank with lid on the bottom for easy cleaning.